A friend's little girl turned three this week, and she asked me to make her cake. 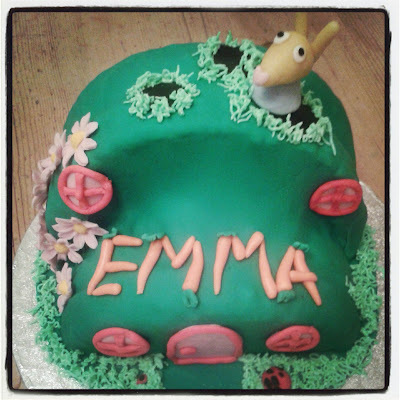 She loves Peppa Pig and chose, of all the characters, Rebecca Rabbit for her cake. I googled Rebecca and just tried to recreate her 'house' which is basically a hill with some rabbit holes. Rebecca herself is made of marzipan, and the green fondant icing came in a packet which warned that the "'Quinoline yellow': may have an adverse effect on activity and attention in children." Whatever - with all the chocolate and jellies, it's not going to make that much difference surely, but thanks for the warning! 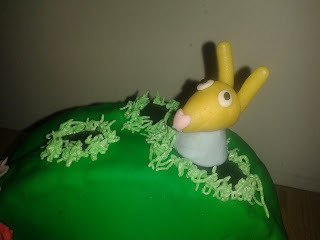 Love using my grass nozzle (from Cake Decorating magazine)! Annie, wow! what a fantastic cake. I bet your friend's little girl loved it.